True Provençal classics in a convivial, bistro-like space, complemented by a deep wine cellar and first-rate sommelier. 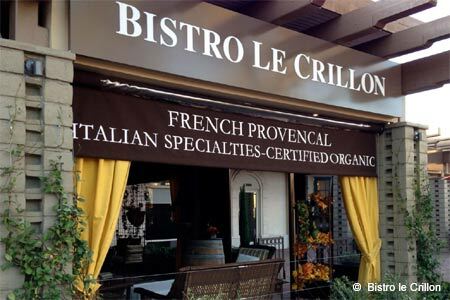 : In this charming French bistro one can have a romantic evening, bring a group of friends to enjoy the garden patio, or just hang out at the wine bar. At dinner, let the owners, chef Chantal Berton de Crillon (her village of birth) and her sommelier-maître d’ husband, Diego Ostroski, put together a French-style meal for you. Italian-born Ostroski recommends wines from his 40,000-bottle, French- and Italian-dominated collection, as the smiling Chantal deftly elevates brasserie food. The place is known for its appetizers, so order a red vin de table while noshing on sweet baked Turkish dates wrapped in salty applewood-smoked bacon, classic buttery escargots Bourgogne or flavorful asparagus soup. French onion soup, three-sausage cassoulet, and French bistro classics like coq au vin and beef bourguignon are also favorites. Desserts include homemade ice creams and sorbets, and the profiteroles arrive dripping in a Valrhona chocolate sauce. Budget-conscious diners will be interested in the affordable three-course menu.